In debates during the Madison mayoral campaign, incumbent Mayor Paul Soglin has frequently highlighted the fact that data illustrating extreme racial disparities outlined in the Wisconsin Council for Children and Families' Race to Equity report was taken from 2011 and insisting that conditions for minorities have improved during his time in office. In reality, that’s not the full picture. Data released Tuesday by the mayor's office combined with the Race to Equity report show a complex picture of racial disparities in Madison and Dane County. Read one way, the data show that, on average, income and poverty disparities have worsened from the 2008-2010 period to the 2011-2013 period. Read another way, it shows that the disparities in 2013 are better than the 2011 number featured in the Race to Equity report, but worse than 2010 and 2009. Data analysts agree it’s too early to point to major positive or negative trends over time. But however it’s analyzed, the data used for the reports still shows a large gap between white and black populations on income, poverty and employment — and some of those gaps may be growing. 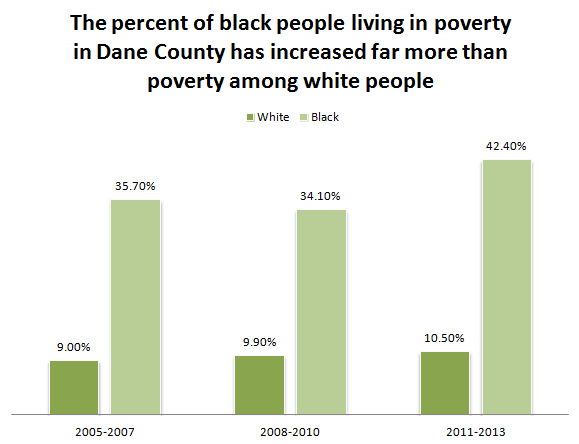 In Dane County, the percentage of the black population living below the poverty level has increased from 35.7 percent in pre-recession 2005-2007 to 42.4 percent in 2011-2013, according to American Community Survey three-year reports. Meanwhile, the percent of the white population living in poverty has only increased from 9.0 percent to 10.5 percent, widening the disparity between the two races. Race to Equity project director Erica Nelson also pointed out that the high number of white college students with low incomes can skew the poverty number, meaning the actual disparity could be even wider. Racial disparities also seem to be widening in median household income. 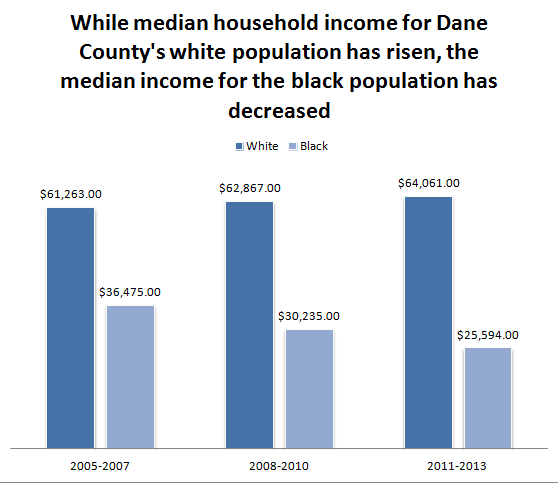 For the white population, median incomes increased from 2005-2007 to 2008-2010 to 2011-2013, topping out at $64,061. Over those same three-year periods, the median income for the black population decreased, ending up at $25,594. That’s a gap of $38,467. The one area that seems to show improvement in the county over the 2008-2010 numbers is employment. Unemployment for the black population declined from 19.8 percent to 18.0 percent while unemployment for the white population decreased from 4.9 percent to 4.5 percent. Those numbers and disparities are still worse than the pre-recession, 2005-2007 numbers, however, when the county’s white population was at 3.7 percent and the black population was at 16.1 percent. “I think with the unemployment numbers for Madison is that coming out of the Great Recession, we’re going to see a reduction in unemployment generally, but we’re not seeing the same decrease in poverty and median household income,” Nelson said. District 5 Ald. Shiva Bidar-Sielaff said those numbers are particularly concerning, pointing to the likelihood that while more people are employed, they are low-paying jobs. Creating employment that does not pay people enough to afford housing does not provide the level of opportunity that people need, Bidar-Sielaff said. “At the end of the day, we still have a wide gap and it’s more about wage and income than it is about the current unemployment,” Bidar-Sielaff said. While the above numbers cover Dane County, the Madison-centric view mirrors the same trends: Disparities in poverty and median income are up while disparities in unemployment are down. Soglin sent that data out to alders via email and had his office send it to reporters Tuesday afternoon, looking at the three-year American Community Survey estimates for 2008-2010 and 2011-2013. His interpretation of the data was that things have improved from 2011 to 2013, pointing to the one-year measures. “We’re closing the gaps and things are improving,” Soglin said. Looking at the overall report instead of one-year measures, however, unemployment is the only gap that closed from 2008-2010 to 2011-2013. Poverty and median income disparities increased. “Even if we are closing the gap in unemployment rate, there’s still some issue related to the level of income and poverty,” said city Healthy Community planner Milena Bernardinello, who compiled the city’s data report. District 8 Ald. Scott Resnick, who is running against Soglin for mayor, said the numbers were “shocking,” pointing to the 18 percent drop in median income for African-Americans in Madison from 2008-2010 to 2011-2013. “He’s using two radically different data sets and is manipulating it off of margins of error to show that the city of Madison is improving, but what the numbers show is we have 9,000 more people in poverty,” Resnick said. The Madison city data has a higher margin of error than the county data and a smaller sample size, making it less reliable. Bernardinello warned against stretching conclusions too far, saying there’s a need for more variables and more data. For now, she said, it’s a starting point. “When we want to understand what the city can do for the citizens, then we need the city data scale,” Bernardinello said. Bernardinello said the city wants to look at more variables and expand the data to include information on the Latino community. “We want to really understand where the disparity is and what’s the magnitude of them and how it’s affecting a certain sector of our population,” she said. There could be issues expanding on the same data, however, since the U.S. Census Bureau may stop releasing three-year estimates. Nelson from Race to Equity is also talking about how the WCCF will move the project forward, looking at different possible measures to see whether progress is being made. Correction: A previous version of the unemployment graphs in this story mischaracterized the data. It is based on unemployment rates.